The Seaham Windows range of front & back doors, stable doors, french doors, bi-folding doors and patio doors ensures that total symmetry with the windows is achieved. With the additonal selections of high quality glass and solid panels available, you can style and individually specify a door to suit your needs. All doors are produced using either chamfered or decorative profiles to compliment the windows. Our specialist team can advise you on the correct solution for you. Each of our front & back doors, and french doors can be designed and fitted to open inwards or outwards, saving space in tight corridors or hallways. All of our doors offer the highest possible security as standard and are manufactured to BS7950 standards. The front & back door range brings elegance, individuality and beauty to your home. With a wide range of glass patterns, designs and shapes - whatever you desire, we are sure to deliver. Our French Double Doors offer an alternative to the more traditional sliding patio door system, and provides more flexibility over design and aesthetic finish. Our patio doors are manufactured to give an attractive slimline appearance. Our In-line door range is available in chamfered or decorative finish to compliment the profiles of both the residential door and window ranges. As with all Seaham Windows products, security is of paramount importance and our full range of inline patio doors are manufactured using reinforced low maintenance PVCu frames, featuring a 6 point locking system, an anti-jacking system and one piece locking keep. Kerbside appeal and first impressions are important considerations when choosing a front door. 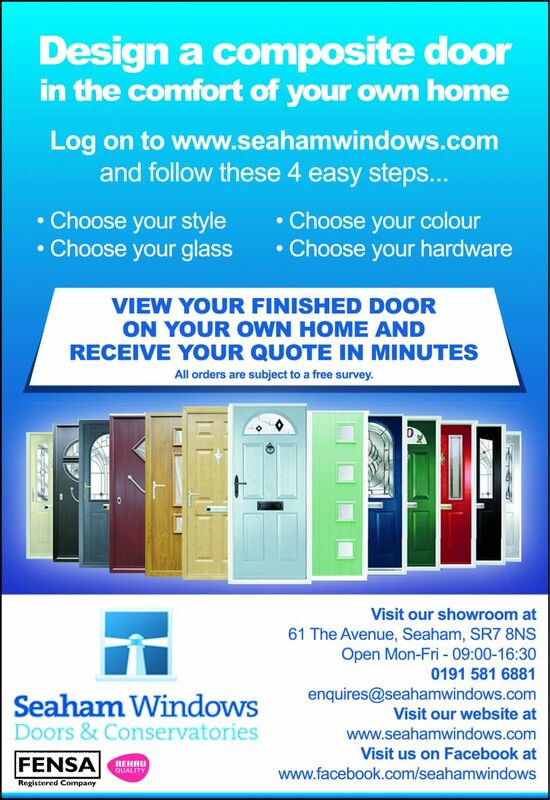 The Seaham Windows range of composite doors offer a more traditional style to the residential door range. the composite door range replicates a traditional wooden door, but with the added security associated with the imagine range. Compsite doors are manufactured by binding PVCu skins onto a dedicated reinforced substrate. The inner core is then injected with a high density polyuthrethanre foam to form a solid, secure and attractive door. The perfect way to open up your home to the terrace or the garden, or alternatively an attractive way to create a room to room divide. The bi-fold door will add elegance and a contemporary feel to your property, bringing the outdoor in. Bi-fold doors are the perfect addition to any room. The design and functionality of these doors open up the full aperture of the frame, allowing optimum light and access into the room with minimum obstruction. All doors are hinged and conveniently slide to the side on a smooth running track in a space saving manner.